You are currently browsing the Breaching The Web blog archives for January, 2011. Many years ago, I used to listen to this great roots rock radio show on KXCI community radio in Tucson, Arizona.It was my first introduction to rockabilly, and was opportune, since there were a couple of good local rockabilly groups in Tucson at the time, including Al Foul (then accompanied by The Shakes). A few years ago, my husband and I bought a boxed CD set called Rockin Bones: 1950s Punk and Rockabilly. I love this collection. Among other gems, it includes Fujiyama Mama by Wanda Jackson. She has an amazing, startling voice. It’s like what Elvis would sound like if he had been a pissed-off woman with a pack-a-day habit and a hangover. She doesn’t sing — she attacks a lyric, wrestles it to the ground and then stomps on it and grinds your face in it. But in a good way. 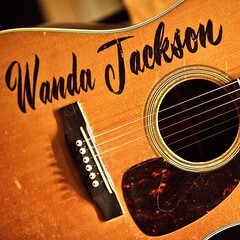 It turns out that Wanda Jackson (who toured with and dated young Elvis for a while), is still alive. And she still sings. And she just released a new album, produced by Jack White (just like that Loretta Lynn album for a few years back). I was vaguely listening to the radio without really paying attention a few days ago, when I heard that unmistakable growly, aggressive, smokin’ hot voice on the radio. I was startled into paying attention to the story — happily so, since I learned about that new album. The Party Ain’t Over is fantastic, overflowing with the fire, passion and pure rock-and-roll self-assurance that characterizes her older music. It’s great fun — I recommend it. This was already highlighted on BoingBoing and Gawker, but I’m fascinated by it, so I’m writing about it too. 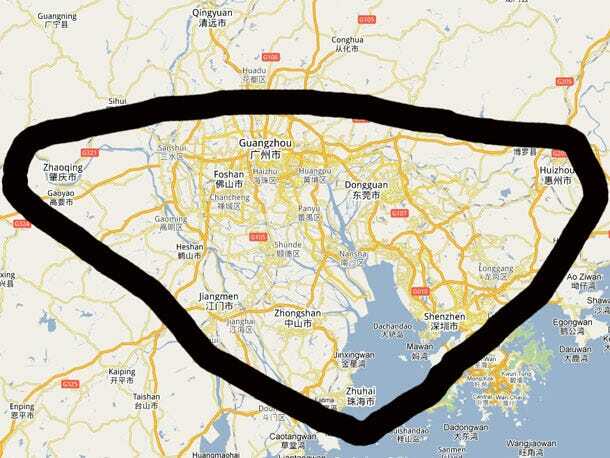 China is planning to merge 9 cities into one megacity. The 9 cities currently cluster around the Pearl River delta, and cover a huge range of industrial and manufacturing activities. The plan will, in theory, allow for more integration of the health, social, safety and transportation infrastructures, and presumably create a larger, more stable economic base. The sheer size of the megacity is mind-boggling. It’s bigger than Wales. It’s twice the size of New Jersey. It’s the size of Switzerland. The city will cover 16,000 square miles and have a population of 42 million people. It doesn’t have a name yet, because no one city of is the central hub, unlike say “Greater London” or the “LA metro area” so a new name will be created for it. On the one hand, I find this completely repellent. Who would want to live in or visit such a horrid, unnatural place. But on the other hand, the efficiency created by this merger is perhaps greener than keeping the cities separate (although since we’re talking about China, greener is quite relative). And it would be super fun if they someday build a dome over the city and install those high-speed conveyor-belt transport systems like those in the Caves of Steel. Are zombies apocalyptic? Or post-apocalyptic? My husband and I had a lengthy conversation the other day about whether zombie stories are typically apocalyptic or post-apocalyptic. 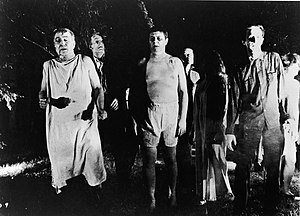 It seems that most such stories take place as things are falling apart (for example, Night of the Living Dead), while some few take place a while after the damage as been done (for example, Day of the Dead). It seems to me that there’s been something of a shift in the genre, from the apocalyptic to the post-apocalyptic. There are more survivalist-type stories about what happens after the fall, such as 28 Days Later or The Walking Dead. Of course, this is hair-splitting, since all zombie stories are stories of survival. But more and more, that survival seems to include solar panels and gardening, not just access to a lot of weapons. I just finished reading Dead City by Joe McKinney. It’s an interesting addition to the zombie genre. It’s written by a police officer, about a character that’s a police officer who’s trying to do his job — and save his family — during a zombie apocalypse. Imagine your favorite police procedural, but where the bad guys are trying to rip off your flesh. It’s tightly-written and action-packed, and the main character is very richly described. I’m looking forward to reading more by McKinney. How Borders lost its groove. My husband and I used to go to the Borders in our town every month or so to look at magazines and pick up a few books. It’s probably been a year since we’ve done that. BBC News Story about the release of declassified documents regarding the 1968 Thule Air Base Crash. I have no words to express my grief and sorrow over the shooting in Tucson, Arizona yesterday . I don’t have anything useful or helpful or inspiring to say here, but I wanted to throw down a marker. I was here, I lived this, and I’m heartbroken. If you’re looking for information or perspective, I recommend Digby. I want to tell you about the Christmas gift my husband and I gave his sister. Nudo creates straight-from-the-grove artisan olive oils from several groves in the Marche region of Italy. 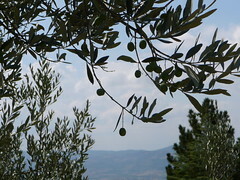 Nudo was founded by Jason Gibb and Cathy Rogers, who bought an olive grove in the Marche and restored it. They wrote a weblog and book about their experience with the grove called “The Dolce Vita Diaries.” The cool thing about Nudo is that you can adopt a specific tree. You get two shipments of oil from your tree (of at least 1.5 liters) — one of first press extra virgin olive oil in the spring, and one of flavored oils in the fall. If your tree doesn’t produce enough olives, its 50 closest neighbors will pitch in. You can even visit your tree. There are several groves you can choose from when you adopt a tree. We were pleased that we could adopt a tree for my sister-in-law from the grove Gibb and Rogers restored. We gave her a Nudo adoption certificate for her tree, the promise of two direct shipments of oil later this year, and a copy of Gibb and Rogers book. This is an excellent gift for a foodie. I may have to come up with an excuse to adopt a tree for myself! (I am not affiliated with Nudo in any way — I just think it’s cool). I like hockey. I don’t love it, but I do like it — especially when I can see it in person. There’s something very intimate about hockey that I don’t feel with other sports, even when you are sitting in a huge arena. Sometimes I think it’s the intensity of the fans, other times I think it’s the physicality of the game. Maybe it’s just me. Sadly, I don’t get to many hockey games. My local franchise is very popular and very expensive (and just far enough away to be very much a pain). And I’m not enough of a sports fan for my desire to see a game to motivate me to overcome those obstacles. I can count on one hand the number of hockey games I’ve attended. Does that make me a hockey tourist rather than a hockey fan? Did you find it stressful to enter junior hockey as a teenager, knowing that you were entering a league where fighting was a real thing? Right so, once you get to junior hockey, you’re not given a misconduct or suspended for fighting—it becomes a five-minute major penalty. Guys that age are considered ready to handle it, and I wasn’t too worried. Of course, it is the first time you’re seeing your friends get in fights. And they’re not always winning them. But once you kind of get past those first couple, you just get used to it. It’s part of the game. Most people think I’m so genteel. But a good hockey fight? Oh yeah. You can’t change your entire life. You can only change your next action. The whole post is inspiring, especially at this time of the year.